China, Kazakhstan, Turkmenistan and Iran have signed an agreement to increase the volume of cargoes shipped through the four countries to international markets by rail. The agreement was reached after a meeting between the representatives of the countries in the Kazakh city of Astana, according to a statement by Kazakhstan's railways KTZ. 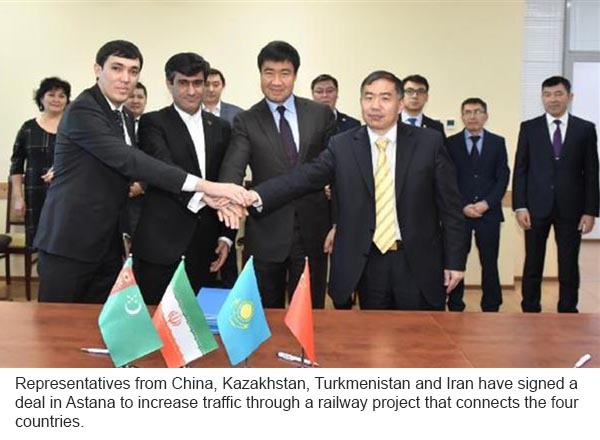 The participants also addressed the issue of establishing competitive tariffs for cargo transportation along the China-Kazakhstan-Turkmenistan-Iran (CKTI) rail route. "Noting the potential of the CKTI international transit corridor, the participants of the meeting spoke in favor of organizing a regular container service on this route," added the KTZ in its statement. The statement further quoted KTZ's Vice-president for Logistics Sanzhar Yelyubayev as underscoring the need to create conditions for the development of container service, formation of stable container traffic, development of the client and freight base, and application of approved tariff rates for container service along the CKTI. The CKTI was officially launched in February when a container train proceeded from Turkmenistan to Iran. The test journey was conducted for adjusting the regular transportation on the new railway route, the Kazakh media reported. The train that was loaded with various goods had left from the Chinese city of Yeiu at the end of January, passed the distance of 7,908 kilometers, crossed the territory of Kazakhstan and reached the Turkmen border railway station of Serkhetyak. The Turkmen site of the new transnational railway route lies from Serkhetyak station to Serakhs on the Turkmen-Iranian border. This part is equal to 1,156 kilometers. The total length of China-Kazakhstan-Turkmenistan-Iran route is about 10,000 kilometers, and the journey that ends in the Iranian capital Tehran will take about two weeks.